National Day of Unplugging is Here: Will You Pull the Plug? It's Lent -- No Tech For You! Time to Unplug Your Technology for One Day? Starting Friday March 4 at sundown, people across the U.S. will turn off their smartphones, laptops, tablets, and other tech gizmos. Better yet, they'll leave them off for 24 hours, during which time they'll try to interact more with friends and family--without the aid of texting or social networks. 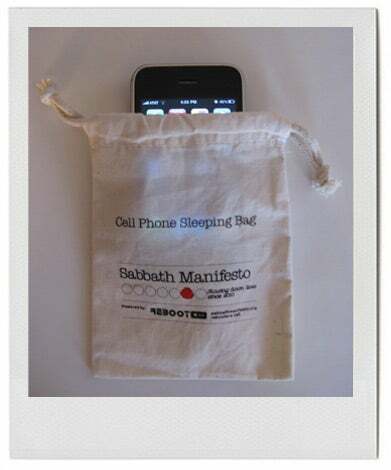 Such is the lofty goal of National Day of Unplugging 2011, an event designed to help over-connected folks "reclaim time, slow down their lives and reconnect with friends, family, the community and themselves," according to Sabbath Manifesto, an ongoing project created by Reboot, a non-profit group of Jewish artists. To help National Day of Unplugging participants avoid the temptation of checking phone messages, Twitter feeds, and Facebook updates, Reboot is selling a Cell Phone Sleeping Bag for $7.99. Sure, it's too late to buy one now, but a clean sock would work just as well. The Sabbath Manifesto includes The Ten Principles that the unplugged faithful should follow. Topping the list is "avoid technology," a hard-to-achieve principle that has gotten the most comments from visitors to the Manifesto's site. Could you go 24 hours without tech?